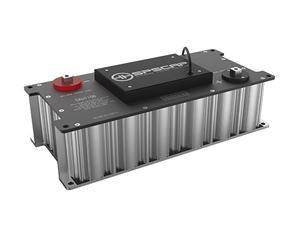 The 48V83F module is a complete energy storage module comprised of 18 series connected individual ultracapacitor singles, of which nominal capacitance is 1500F. This 48 voltage capacitor module includes cell balance voltage management circuitry which can protect each cell from operating in a damaging overvoltage condition. The series module has the function of polling (each cell voltage output), and the caution of over voltage or overheating, are mainly used in automotive、railway、wind turbine、industrial、micro grid power storage，ect. The module is fixed by positioning holes on four corners, and output by the connection terminals on both sides. The 4P terminal of the supercapacitor module can output the signal of overvoltage alarm and temperature monitor. To avoid arcing and sparking the energy storage module should be in a discharged state and the system power disconnected during installation. The module is shipped discharged and with a shorting wire. Shorting wire should be removed prior to electrical connections. The positive terminal is threaded for M8 x 1.25 steel bolts. The negative terminal is threaded for M10 x 1.5 steel bolts. Maximum thread depth is 20 mm. Spring washer are required to ensure long term, reliable connections. The wire should be used in a suitable length, and pay attention to the polarity of the module according to the sign.